Gamescom has given us our first glimpse of Claire Redfield’s campaign in the new Resident Evil 2. It’s the perfect showcase of the remake’s action, which is claustrophobic in the extreme. It’s a strange experience to see ‘new’ footage of Resident Evil 2 – watching familiar beats play out in unfamiliar ways. In this case, we get to see some of Claire’s misadventures in the police station, where she encounters young Sherry waiting out the apocalypse behind a makeshift shield of junk. You might remember her father a little better – the hideously mutated William ‘G’ Birkin, partly responsible for the spread of the zombie virus. The battle with Birkin is a confined boss encounter for the ages, modernised here with steaming pipes and the spark of metal against metal. The huge glowing eye socket in his shoulder, though, is still ‘90s as all heck. 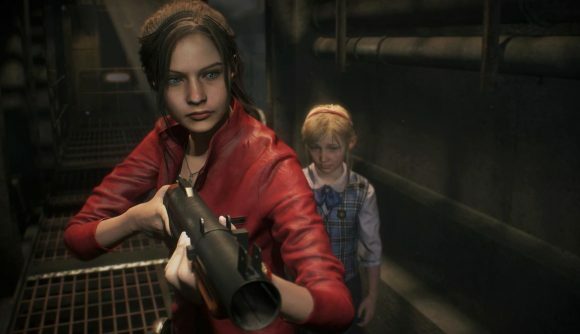 This clip of Claire’s campaign is a nice contrast to what was shown of the revamped Resident Evil 2 at E3 – which focused on Leon and the game’s exploration sequences. Earlier in the summer we decided that Resident Evil 2 has set a new standard for remakes. Best check if you meet the system requirements ahead of its release on January 25th.